WHAT IS CODE 3 FOR A CURE? 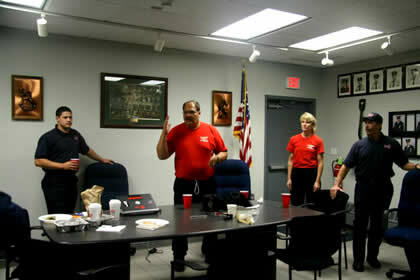 Code 3 for a Cure ® (C3FAC) is a national nonprofit 501(c)3 public charity established on June 1, 2008. C3FAC is a centralized organization located in California, is led by two Officers and a five-member Board of Directors, and does not have any chapters or affiliates. 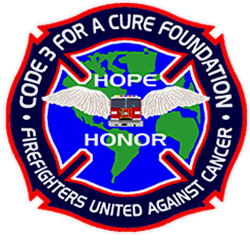 Code 3 for a Cure is dedicated to addressing cancer in the fire service by promoting awareness of cancer as an occupational hazard of firefighting. So what's the meaning behind the phrase "Code 3?" The term is used to refer to an emergency vehicle going to the highest level of response in an emergency situation, when lights and sirens are utilized. Its meaning in the context of this organization is, let's move to the highest level of response to help cure the effects of cancer for a group who is among the most heavily afflicted by the disease due to the toxins to which they are exposed as they protect the lives of others.